1 oz lot of 100. 1 oz lot of 500. 1994-P Proof Silver American Eagle PF-70 NGC (Registry Set) - SKU #34563. Featuring one of the most beloved designs in American coinage, the Silver Eagle saw instant popularity upon its 1986 release. These examples, certified as perfect 70 by NGC, have added collectible appeal on top of their inherent. NGC encapsulation protects the perfect 70 condition of the coin. Mirrorlike Proof finish adds further beauty with an impressive shine. Weinman's design showing Lady Liberty draped in an American flag, walking gracefully as the sun rises over a ridge. Reverse: A heraldic eagle is shown below 13 small stars, representing the original colonies. Sovereign coin backed by the U. One of the most popular designs in all of American coinage, the Silver Eagle combines beauty with Silver bullion appeal. 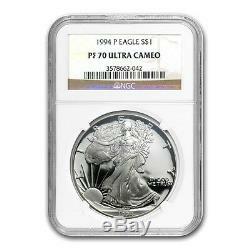 Add this Perfect 70 1994 Proof Silver Eagle to your cart today! Each package is fully insured. Orders of all dollar amounts are welcome. Q: Can I change my order once it's placed? A: Processing begins immediately upon completion therefore changes cannot be accepted. Q: Can I cancel my order? A: Once your order is completed it cannot be cancelled. Please be certain of your order before finalizing. Risks All investments involve risk; Coins and Bullion are no exception. The value of a Bullion Coin e. American Eagles or Canadian Maple Leafs is affected by many economic factors, including the current market price of Bullion, the perceived scarcity of the Coins and other factors. Some of these factors include the quality, and current demand and general market sentiment. Therefore, because both Bullion and Coins can go down in price as well as up, investing in them may not be suitable for everyone. Because all investments, including Bullion and Coins, can decline in value, you should understand them well, and have adequate cash reserves and disposable income before considering a Bullion or Coin investment. Precious Metals are characteristically lustrous, ductile, rare and nonreactive. The term "Semi-Numismatic" means a Coin that has both Bullion and Numismatic value. No other relationship, including, without limitation, any agent-principal relationship, any employee-employer relationship, any franchisee-franchisor relationship, any joint venture relationship or any partnership relationship, between APMEX and you exists. You may not assign any of your rights or obligations under these T&C without the prior written consent of APMEX, which may be granted or withheld by APMEX in its sole discretion. This contract, including but not limited to the T&C, shall be binding on all permitted assigns and successors of APMEX and you. It is APMEX's goal that any disagreement or dispute be resolved expeditiously. A decision or a failure by APMEX to take action with respect to any non-compliance by you of your obligations to APMEX or to insist upon strict adherence to any term in these T&C, does not affect the ability of APMEX with respect to any other non-compliance by you, and does not waive or limit APMEX's right thereafter to insist upon strict adherence to that or any other term, whether of a similar or dissimilar nature. The section headings are included for ease of reference and do not affect the interpretation or the scope of these T&C. These T&C are intended to be enforceable to the fullest extent permitted by applicable law. If any term of these T&C is held to be unenforceable for any reason, such unenforceability shall not affect the other terms of these T&C, and the term that would otherwise be unenforceable shall be enforced to the fullest extent that it would be enforceable. APMEX may amend these T&C at any time by posting the amended terms on the website, and such amendments shall become effective immediately. If you become aware that you may be required to make any disclosure of such information, including, without limitation, as a result of the receipt of a subpoena or other compulsory process, you shall promptly notify, in writing, APMEX and you shall cooperate, in good faith, with APMEX in obtaining a protective order or other appropriate relief, if any, with respect to such disclosure. The item "1994-P Proof Silver American Eagle PF-70 NGC (Registry Set) SKU #34563" is in sale since Tuesday, February 20, 2018. This item is in the category "Coins & Paper Money\Bullion\Silver\Coins". The seller is "apmex" and is located in United States. This item can be shipped to United States.